﻿ 2xKONIS-B – KONČAR Elektronika i informatika d.d. The most important energy facilities (thermal and hydro power plants, large transmission substations, etc.) should have the highest possible reliability of power supply because the possible damage caused by a power supply failure at a critical moment can surpass by far the price of power supply. 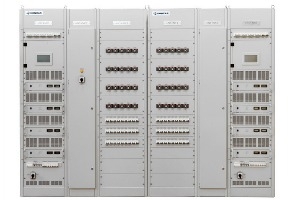 The right choice for such facilities is redundant parallel connection of two completely independent power supplies. Thereby independent double supply of each load or a small group of loads is provided. Redundancy of cables themselves is often applied. High reliability is based on the requirement that the failure of one system does not in any way affect the operation of other system, which continues to supply all loads without interruption. DC power supply system 2xKONIS-B consists of two completely independent power supplies KONIS-B, configured in a redundant parallel system.